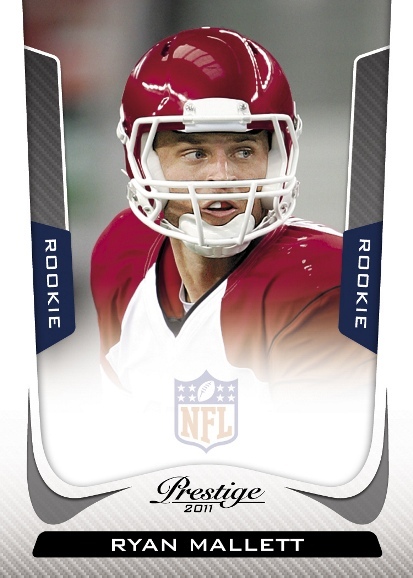 Panini's Prestige returns for another season of post-draft gridiron prospecting. 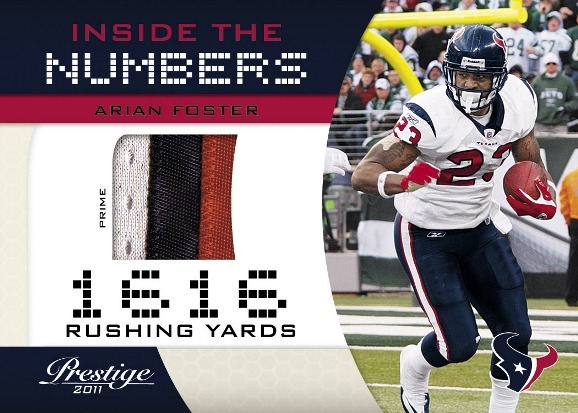 The latest installment of Prestige features a sleeker card design than past years as well as several new inclusions highlighted by NFL Passport inserts and autographs. 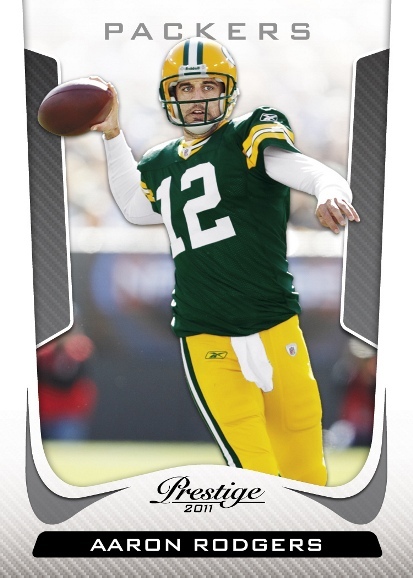 2011 Prestige is set to release on May 11th, with each $80-$100 hobby box delivering 4 hits, 24 rookies and 23 additional inserts and parallels. 24 rookie cards and 23 inserts/parallels per hobby box. 250 card base set featuring 100 rookies. 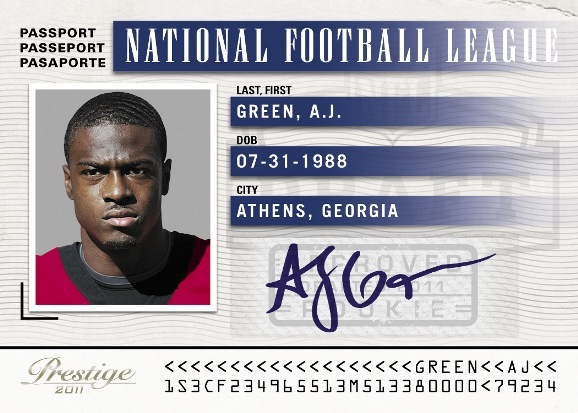 The industry's first 2011 football card product with the correct draft and team information. Cam Newton, Ryan Mallett, Jake Locker, Mark Ingram, A.J. Green and Julio Jones highlight the early rookie checklist. NFL Draft Class embroidered patch autographs, Draft Picks Rights autographs and Rookie Card variations return! New NFL Passport inserts and autographs featuring big name rookies! 2011 Prestige Factory Sealed FB Hobby Box Cam Newton ROOKIE ??? 2011 PRESTIGE FACTORY SEALED FOOTBALL HOBBY BOX KAEPERNICK ROOKIE ??? I buy Prestige EVERY year it comes out and I can’t wait for this years! Always always a GREAT product EVERY year! 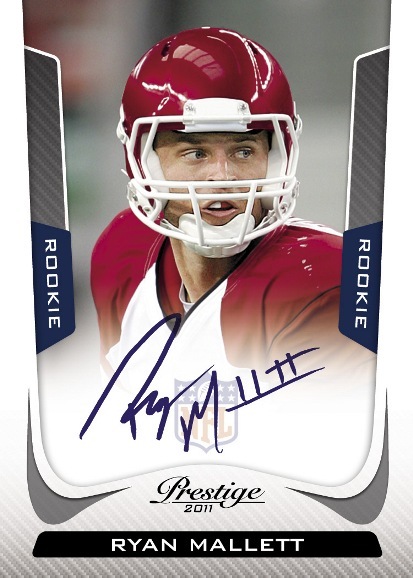 -The positive is short-printed rookies with the NFL logos, and many of the Autographs are “on-card”. The variation rookies holding up their jerseys from draft day ae sweet. -The dislkes about the product are that many of the autographs are of undrafted Free-Agent rookies. Another issue is that many of the jersey game used cards are not serial numbered yet some undrafted free agent rookies are? Very strange. For example I got a nice Ndamakong Suh Jersey card with no serial number, yet I got a Pat Delvin card numbered to 999? Not worth the $90 price tag in my oppinion. I sure hope in 2 weeks Panini steps up their game with Donruss Elite. – Part of my problem could be coming off of all the beautiful “High-End” releases just a few months ago of the 2010 products.